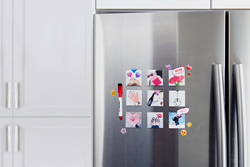 CanvasPop’s new photo magnets deliver memes, emojis, stickers and Instagram pics to your refrigerator door. Today CanvasPop introduced Photo Magnets and accompanying Personalization Kits, the newest products from the company that has revolutionized the social photo printing industry. The new service will allow customers to upload and print any photo from their computer, Instagram or Facebook account and transform them into a set of high-quality handmade magnets. Customers will also have the option of adding a bonus pack, dubbed the “Emoji Kit” to further personalize their experience. The kit includes a magnetic dry-erase marker, magnetic talk bubbles, emoji magnets, and stickers, giving customers a fun and creative way to add their own personalized touch. The magnets offer the perfect way to personalize refrigerator doors, cubicle walls, lockers, laundry machines or any metallic surface anywhere. CanvasPop’s photo magnets are both stylish and functional, handcrafted using the highest-quality materials, in the company’s North American production facilities. The sets of 2”x2” magnets are sold in packages of nine. Each set is beautifully packed in a compact carton, perfect for gifting. A set of nine magnets retails for $25; the Emoji Kit is available for an additional $9. There are over 1 trillion photos captured by mobile phones every year, and this number is steadily increasing. CanvasPop has been at the forefront of the digital photo printing wave since the company launched in 2009. Since that time, CanvasPop has been recognized as an industry leader in bringing digital elements back to the physical world through their Photo Printing API and were also the first company in the world to launch large format Instagram Prints. Visit http://www.canvaspop.com/products/photo-magnets to learn more and to start making beautiful things from your mobile photos. CanvasPop is the web’s most innovative leader in on-demand printing and personalization. Founded in 2009, the company focuses on providing world-class customer support and delivering the highest quality canvas prints, art prints, home decor, and accessories and is constantly innovating the way consumers can order personalized products online. CanvasPop has printing and distribution facilities in the United States and Canada and ships across the EU. For more information please visit http://www.canvaspop.com.